Boston area drivers beware: The Boston car theft rate is 1.83 times the national average, meaning your car is twice as likely to be stolen in the greater Boston area than anywhere else in the nation! With such a high incidence of theft, it’s essential to take steps to protect your vehicle from break-ins, theft, and other security issues. At Mega Watt Car Stereo and Security, we understand that your car is an important (and often expensive) investment, which is why we’re proud to offer a variety of vehicle security solutions in Boston and the surrounding communities. With over 15 years of experience, our professional staff have the knowledge and skill to help you find the right car alarm system for your needs. We also provide swift and precise car alarm installation, acting as your one-stop shop for reliable vehicle security in the Boston region. Call or e-mail us for more information. 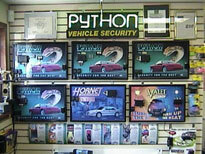 Specializing in Python vehicle security systems, Mega Watt Car Stereo and Security carries a wide variety of car alarm systems, ensuring affordable, top-of-the-line solutions for you and your family, regardless of your vehicle type. Our vehicle security professionals are well versed in the specifications of all of our car alarm systems, and can help you to find the one that best meets your needs. Whether you’ve got a shiny sports car, souped-up SUV, or reliable minivan, you can trust our vehicle security experts to have the knowledge and expertise required to keep your car safe. We even offer vehicle security systems with additional features like keyless entry and remote starters, designed to make your car alarm system as convenient as possible. Whether you’re looking for a comprehensive car alarm system with a shock sensor and starter kill or you just need a simple car alarm with remote start and keyless entry, Mega Watt Car Stereo and Security is your source for reliable, cost-effective vehicle security in the greater Boston area. Obviously, your car alarm is only as good as the mobile electronics shop that installs it, so Mega Watt Car Stereo and Security is proud to offer fast and effective car alarm installation. An improper installation could result in the failure of your car alarm system, so don’t trust just anyone to get the job done—for professional, expert vehicle security installation you can rely on, you need Mega Watt Car Stereo and Security. We’ve been car alarm specialists since the very beginning, and with over 15 years of experience, we have what it takes to safeguard your car or truck. And, don’t forget, our installers are MECP-certified to bring you additional peace of mind. If you’re ready to equip your vehicle with a car alarm system that will protect it from theft and enhance your overall vehicle security, call Mega Watt Car Stereo and Security today. We’ll schedule your appointment for swift and accurate car alarm installation, and our vehicle security specialists will gladly answer any questions that you may have.